Piezo Puppy - pickup preamp for ceramic phono catridge. 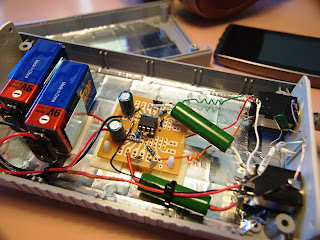 Yet another build of an OPAMP based piezo pickup preamp. The OPAMP again is an OPA2134 (socketed). The single cct. brd. 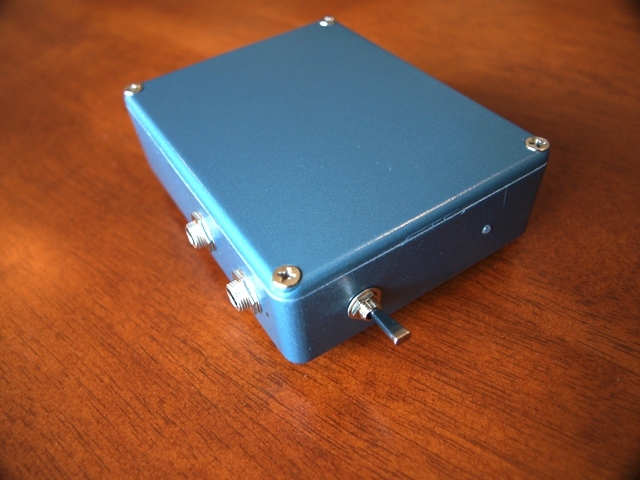 holds both the differential PS, generated by a resistive network and capacitors and the preamp section itself. Control of treble is via a small pot and can be used to "tone-down" surface noise found on most 78 records. 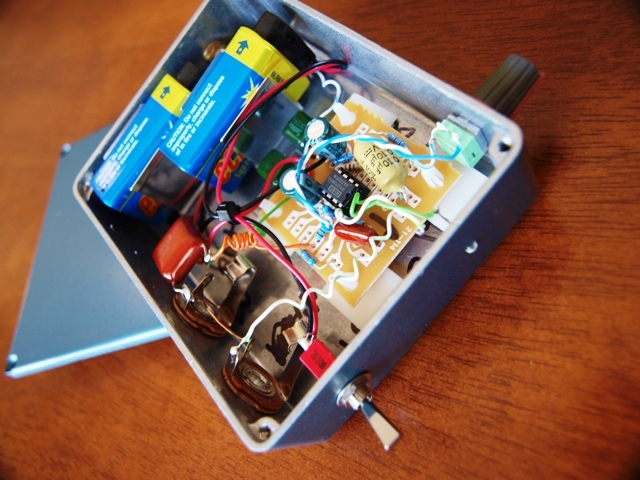 There is a battery test point at the front of the preamp to allow easy battery checks without opening the case. 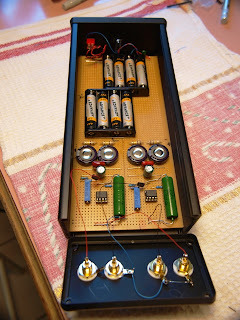 A mustard cap is used on the input and a poly on the output. Internal wiring is solid core copper wire. The case is cast Al and again I have used the hammertone finish which I think is quite attractive. This completes my 78 setup with a new stylus in my Ronnette piezo cartridge. With some reasonable 78s I have managed to get some enjoyment out of the shellacks. 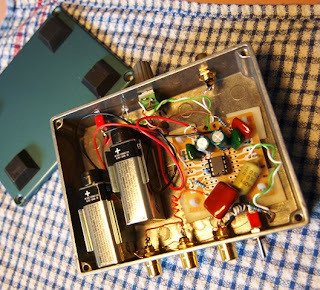 I built a single jFET preamp for my mate's double bass which is fitted with a piezo pickup under the bridge. I couldn't make it work properly and therefore this OPAMP based attempt. Mustard caps are all the rage with pedal makers and I just happened to have about 6 from my early electronic days mostly 0.1uf. Mustard cap on the input and polypropylene on the output. The paint job is a poor attempt at hammertone. Right colour no hammer?? The OPAMP is my fav. OPA2134 and is running at 18V. Input impedance is a ridiculous 10M. There appears to be good gain and the pot seems to enhance treble as it is turned up. I work both sides of the proto-board and even cut a track for compactness. 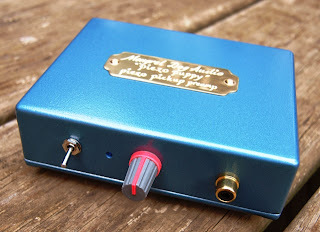 Based on the high performance OPA2134 OPamp chip this headphone amp\driver is good sounding and portable. 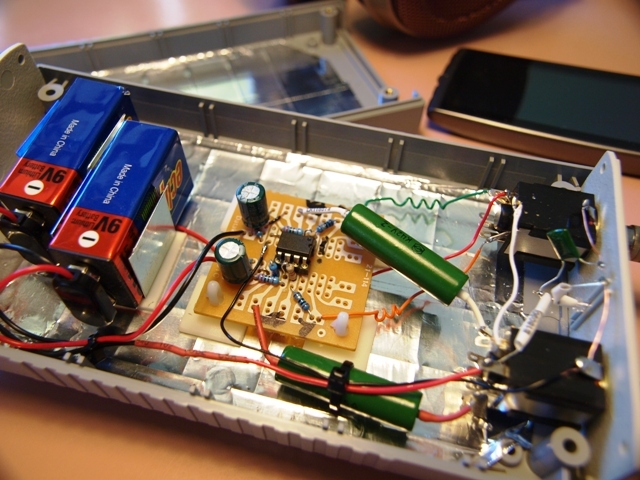 The schematic is based on the CMoy design with some changes in passive parts values. 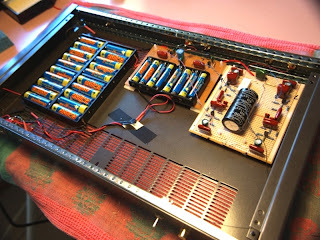 I elected to run it on two 9V batteries for better battery life and greater dynamics. 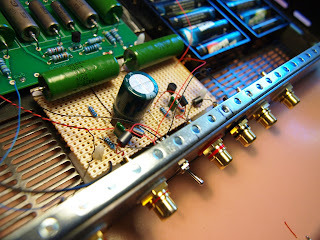 There is only 4" total of hookup wire in the signal path and all component-2-component connections on the proto cct. brd. Low ESR 200uf caps and a resistive network provide the differential voltages required to operate the chip without an output cap. The brd. is silver soldered with Mil.spec machined chip socket and Russian PIO caps on the input. 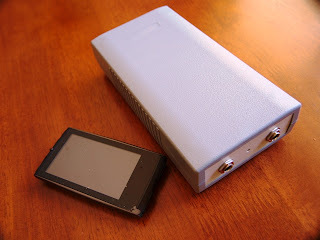 Power only comes on when both phone jacks have plugs in them and the power switch (at the back) is on.The enclosure is impact resistant and lined with heavy Al foil for shielding and enclosure resonance control. The sound is clean and bright with good volume and dynamics. The amp is dead quiet with no signal. SynergyII\Cu started with 3.6kg of 100% very thick copper plate. The enclosure was selected, a 1U, 19” rack mount. The challenge was to build a pure Gainclone with its three resistors and simple 1500uf storage caps in a compact 1U enclosure. Everything had to fit in this tiny space including 48VAC of tranni, power filters and rectifier cct. To achieve this two 24V ultra low profile toroid trannies were selected, the rec. cct. brd. was constructed on a tag strip with super fast, soft recovery diodes (snubbed with 0.01uf polies) and a compact EMI\RFI power filter installed across the mains. A pseudo smoothing cct. is provided with a couple of 4.7uf polies on the differential voltage rails. The 1500uf electrolytic are snubbed with 0.1uf polies at the chips. A simple ferrite choke sat around the power cord inches from where it entered the amp. Solid 0.4mm five-nines pure silver wire connects the earth point on the PS to the input RCAs and speaker binding post returns. Heavy multi stand copper wire connects the differential PS, individually, to each chip amp cct. Total weight is 9.6kg. 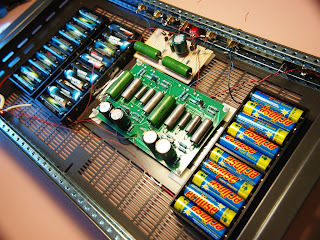 Being a DC amplifier bass is extended and controlled. The sound is clean, clear and solid with plenty of power. 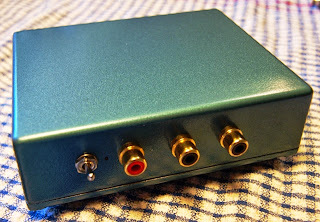 I was asked to make a MC phono preamp for an audio club member. 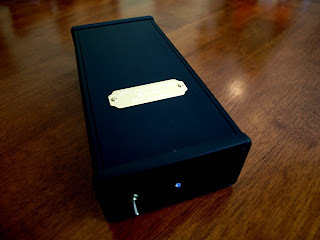 My experience with both my clone of a Boozhoundlab (BHL) phono stage and the Le Pacific MC preamp made it easy to put together a dedicated MC phono preamp. 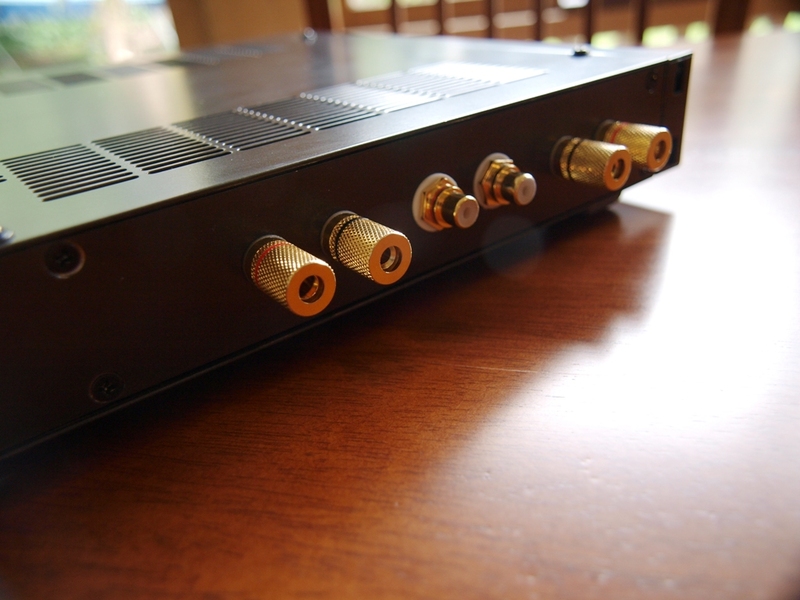 I used my previously made BHL Chocolate Box phono stage with RIAA equalization and a freshly built Le Pacific stage. Both of these modules are good performers. After building the Boozhound Labs (BHL) MM phono stage, with RIAA compensation and finding it a fantastic preamp, I added to it a MC stage. The BHL phono is the best preamp I have built and I have built quite a few. Because I moved to an Ortofon Rondo Blue MC cartridge I required the addition boost of signal from the cartridge. 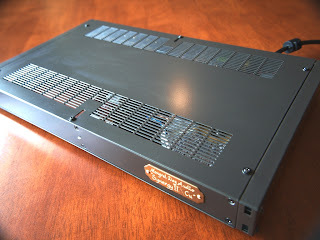 The Le Pacific MC stage (also reviewed on my blog) is simple to build and works well. Both the MM and MC stage run from their own battery sets and can be turned on individually. There are separate MM and MC RCAs on the back of the preamp to allow a MM and MC TT to be connected. A single switch allows you to chooses between either input. 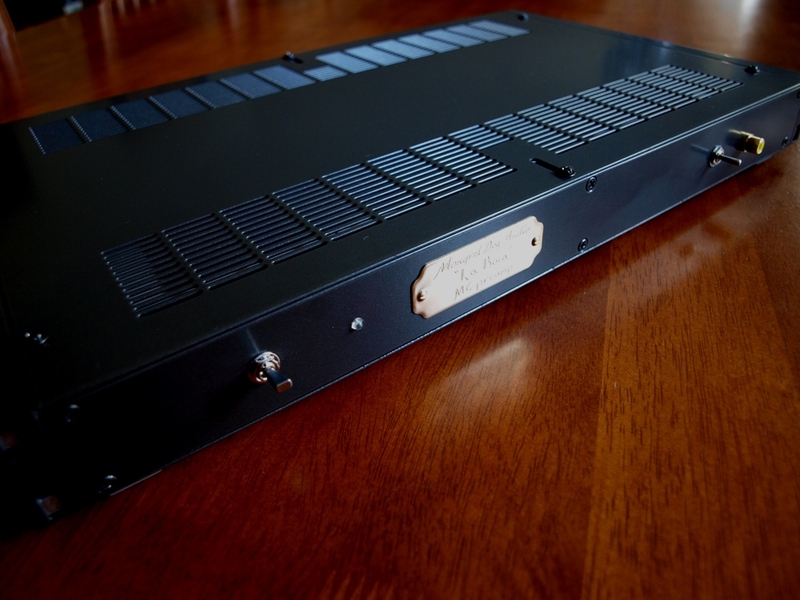 The preamp is housed in a 1U 19" metal case. Both the BHL stage and Le Pacific stage use only Russian PIO military caps which I have also used extensively on other projects always with excellent results. 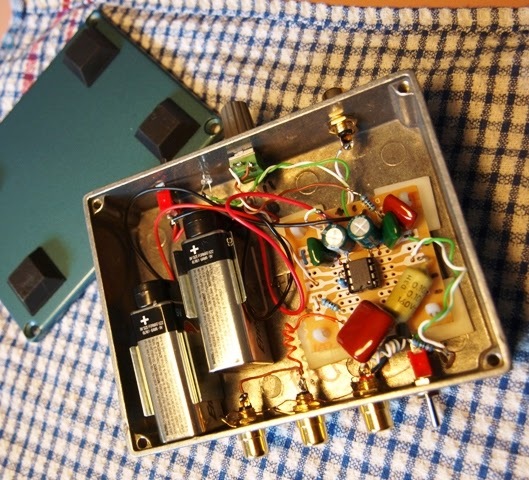 Bitumanised heavy Al foil lines the base and lid of the case and when the lid goes on a layer of sound deadening Dacron is layered over the cct. brds and fills the enclosure. All hook-up wire is silver plated fine copper wire (wire wrap wire) and ferrite beads are used extensively on all RCA wire connections. 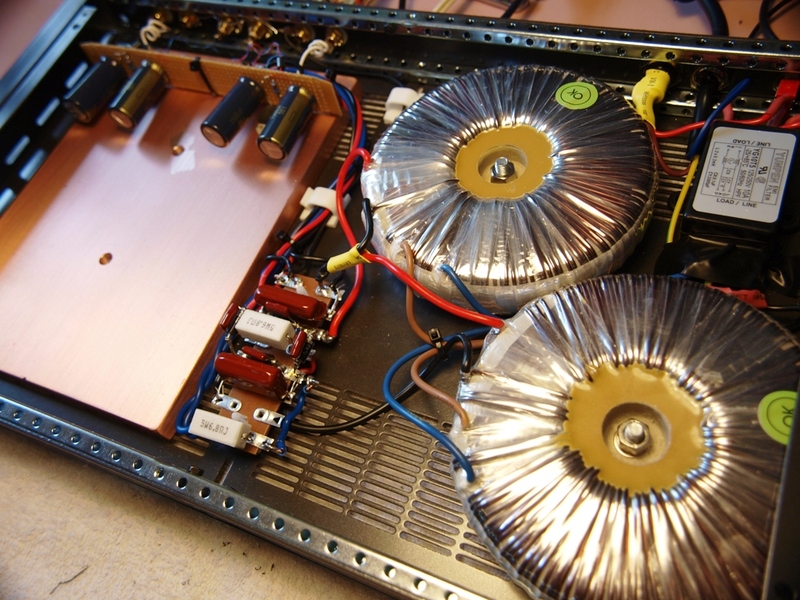 The preamp is dead quiet using only 2SK170 JFETs and quality metal film resistors and electrolytics. If you have not tried the BHL kit for the money, they are excellent value and top performers.